One thing that I noticed out of this experience was that few people, if any, ever reviewed dryers outside of the couple of reviews that were on Sears’ own web site. That’s not super-helpful. So, here’s my review of the dryer I bought, in case anybody else wants to buy one. 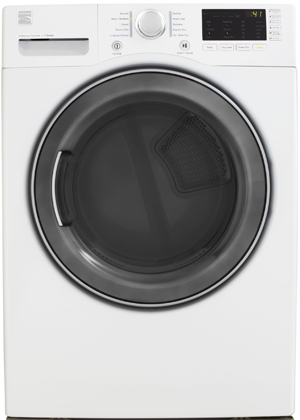 Note also that this is a white-labeled LG, which is also top-rated by Consumer Reports. Figure that if you buy the LG version of this or the Kenmore version of this, it stands to reason that the performance should be within a minimal margin of error. This dryer currently retails for $1299.99 and we paid $999.99, a mere $40 under the price listed on the Sears web site as of February 16, 2013. Depending upon your state regs, you may or may not have to tack on the cost of professional gas installation; delivery and installation fees above and beyond that are typically things you can get out of if you manage to hit Sears at a time when they have a free installation offer running. My four key dryer requirements are: performance (must dry well), size (must have excellent capacity), speed (must not take 2hrs to dry a load of delicates), and ease of repair. We chose this model so that we could have something roughly equivalent in size to the Samsung we were replacing and with similar features, such as the sensor dry. Please note that ALL of the comments below are based on the dryer’s performance FOLLOWING the replacement of the problematic vent flap. Performance: GOOD. The dryer’s sensor dry settings work quite well when you set the dryer to the “Extra Dry” setting. Leaving the sensor setting on the default middle dry setting seems to leave a few more clothes in the damp / not quite dry state than you’d have if you just bump it up a notch. The time sacrificed for this is minimal; it seems to be maybe a handful of minutes longer to get dryer clothes. We typically stick to the “Casual” setting, which appears to be somewhere between what we know as “Delicate” and “Permanent Press” and that’s our general go-to setting. Size: EXCELLENT. If you stuff your washer, the dryer can handle everything you put in and then some. it has a cavernous interior with a bonus light that helps you spot that one random child’s sock you’d rather not have to come back for after you made it all the way upstairs with a full load of dry clothes. The one caveat I have here is that the dryer has issues with very small loads. It just doesn’t catch them in the sensor nearly as well because items may not touch the sensor. Super small loads should go in on the time dry settings and just be manually controlled for temperature and time. Speed: GOOD. Loads finish generally close to the time initially indicated when you set the dryer up, and we haven’t found many cases where we’ve needed to add time or re-run cycles. Ease of Repair: EXCELLENT. Sears services everything they sell, and it’s easy to set up an appointment with a Sears home technician over the phone. The Sears tech who came to our house to diagnose the problems I was having with the dryer when I first took delivery was friendly, courteous, knowledgeable and thorough. Having had trouble servicing our Samsung dryer, I can say without a shadow of a doubt that serviceability is a key component of any major appliance purchase for us. The controls are easy to figure out and operate; as you can see from the picture below, you can control with the knob and then tweak (where allowable) with the settings buttons on the right-hand side of the control panel. One thing that differs here from what I was used to on the Samsung is that you have to turn the dryer ON before turning the knob or pressing a button; the dryer also turns itself off immediately after a cycle ends. Our prior Samsung dryer used to turn on the second you moved the knob and it displayed “END” when it finished. This is just behavioral changes for us; when we see the control panel is dark, we know the cycle is complete. Overall verdict: I like this dryer A LOT. Once we got the vent flap issue sorted out, I saw the performance I’d wanted to see all along. The dryer meets my expectations, which is apparently a lot to ask of appliances in an era of (expensive) disposable technology. It’s easy to operate, and if I have service issues, I know exactly where to turn and have every bit of faith that they’ll handle it professionally and quickly. Where to buy: this dryer is available from Sears and I purchased mine via Sears.com. While it may not be on display at your local Sears, you can always order it there. Given my issues with online purchasing via Sears, I recommend either calling or visiting your local store and giving some nice human being the commission. This entry was posted in product reviews and tagged appliance shopping, dryer review, gas dryer, gas dryer review, Kenmore, product review, Sears, sears.com by crunchymetromom. Bookmark the permalink. Thank you for your candid review. I’ve just bought the same dryer and will also see how it compares. I am impressed with the customer service of Sears and just because of that I will always buy my appliances through them.